Since my last post when I recommended entering fresh short positions on any uptick in the USD1.36 price area the euro vs dollar has collapsed to a fresh 18 month low of USD1.3033 – over 600 pips – so well done if you followed my analysis. Indeed we are now very close to my medium term target of USD1.30 which given today’s downward’s pressure may even be achieved today. With the Greek drama continuing to rumble on, and with the markets clearly unconvinced by the various promises and statements the euro can only continue to weaken further. The technical picture remains firmly bearish with the current price action seated well below all four of our moving averages and in particular both the 9 and 14 day are pressing down and providing a barrier to any short term reversal. The weekly chart also confirms this view, and as we now break below USD1.30 there is virtually a clear drop to our longer term target of USD1.25 where we will be closing out our longer term positions and looking for consolidation in this price region with a possible recovery in the latter part of the year. 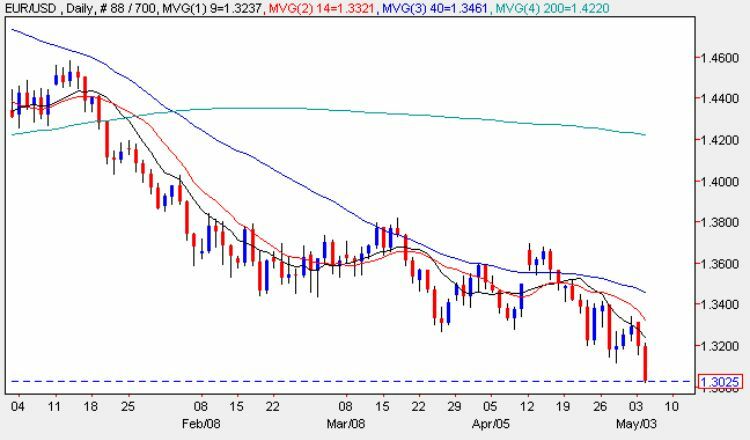 Here to the moving averages are pressing heavily downwards, particularly the 9 week and 14 week with the 40 week now turning strongly and potentially closing below the 200 week. The main items of fundamental news for the euro vs dollar are to be found in the latter part of the week where the highlight is, of course, non farm payroll on Friday which is preceded by the ADP figures tomorrow which generally provide a good indication of Friday’s data. The forecast for tomorrow is for ADP to be positive at 29k, reversing last month’s negative of 23k. The other key fundamental news this week will be the interest rate decision in Europe on Thursday, followed by the press conference which in turn is followed an hour later by a speech from Fed Chairman Ben Bernanke.